The Folk Art Heart is a fun little pattern. When made with the materials listed below, the finished heart measures 4.5 by 5", the perfect size for a coaster or mug rug. It can also be used as an appliqué to add some homemade goodness to your favorite jeans, t-shirt or tote. 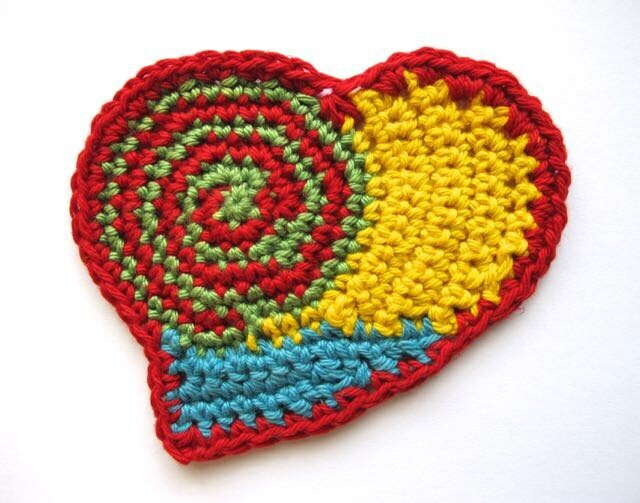 Have fun experimenting with different colors and yarns to create your own unique Folk Art Heart. Size- Finished heart measures 5” wide and 4.5” high. Increase or decrease size by using heavier or lighter weight yarn with an appropriate size hook for the yarn selected. If paying by PayPal, this PDF Pattern will be sent to the email address associated with your PayPal account. If paying by credit card, the PDF will be sent to the email address associated with your Etsy account. If you would like your pattern sent to a different email address, please contact me with that information. This purchase is for the Folk Art Heart pattern only. It does not come with the heart pictured here. This pattern is copyrighted and for your personal use only. It may be made and given as a gift, but the pattern may not be reproduced for use by others. I hope you enjoy making the Folk Art Heart!